I Installed this keyboard interface into the 130xe that was going to be installed into the PC Tower Case since this 130xe was in sockets it made installing this upgrade very easy. I captured this web page back in 2005. I have two of these devices and I like them a lot. I hope someone goes to making them again soon. Seams like everyone wants to build Ram Disks or SIO2nnn devices. I just like having the same keyboard for all of my Computers. Connect a PC-Keyboard to your ATARI 800/130! New professional manufactured board now available ! * The PIC must be placed into an PIC programmer device, also programming software will be required. First, before you start, you will need an PC-keyboard. They are very cheep this time, its no problem. Who wants to use an ergonomic cherry keyboard can do this also :-). Look for 101/102 keys and MF2 standard. 5p DIN and PS2 can be connected. All keyboards common this time, do this !!! Newbies better use the DIN connector cause the PS2 is more difficult to solder. All work should be done when the ATARI is switched off. Also a basic electronic tool set should be available (there's no need of an oscilloscope etc.). Open the ATARI, put a hole for the connector. 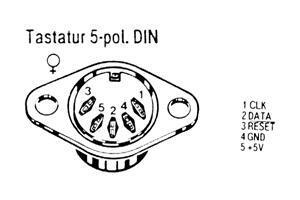 The connectors should be placed from outside, then you will have no problems with the fixing holes. A solid mechanical connection will be recommended. There isn't an exact position giving for the connector. Everybody can choose its own place. You should use short cable connections to the AKI. Lengths under 50cm are uncritical. Attention! A longer shortcut of the power supply can be bad for the ATARI-supply unit, a longer swap of the power supply lines will be bad for the AKI CPU (PIC) and can kill the PC keyboard. A swapping of the data lines will have no destroying effect (normally :-)). 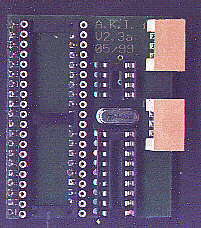 The figure shows the installation of an 5p DIN connector in the ATARI 800XL. Its placed between the SIO connector and the bus expansion port. 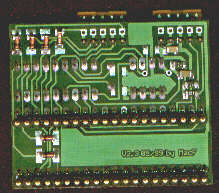 The AKI interface is placed 'up packed' to the POKEY chip (10 soldering positions). It will be nice to have an ATARI with sockets for the chips !!! Place out the POKEY, sold on the AKI and place the POKEY back. If your POKEY have no carrier are there 3 variants: The first one, you solder the AKI direct onto the PIC, this is something complicated cause there's not much space to solder. 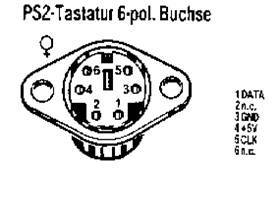 The second is you place a socket for the POKEY, but this is much work and should only be done from professionals. The third version is you sold an 40p carrier up to the PIC an plug the AKI inside. In this case you must put a hole in the ground shield (the ATARI can also work without the shield, but there can be reduced video picture quality). Eventually, an capacitor, right under the POKEY must be layer down. 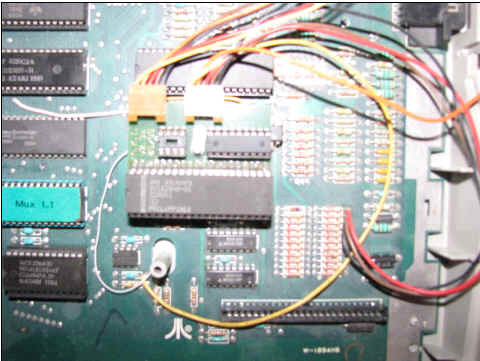 installation of the first prototype in the ATARI 800XL. 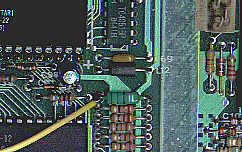 Connection of START, SELECT and OPTION in an ATARI 800 XL (the 3 resistors are right down outside the ground shield). Connecting RESET line (green / white), right under the AKI. 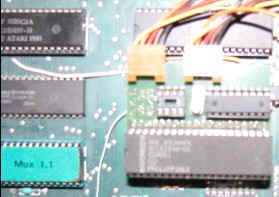 Now, also a connection to a switchable RAM-Disc can be done. This can not be specified without knowing of the inserted RAM-Disc technology, see section "AKI and RAM Extensions" for more details. Now turn on your ATARI, test the function of the old ATARI keyboard. If it works, plug in the PC keyboard and start ... You can start the ATARI build in keyboard test, but this will not be a good indicator to test the PC keyboard. If only one key don't work, the defect is placed in the PC keyboard. If nothing works the whole installation must be checked. Latest, after plug out the PIC of the AKI, the old ATARI keyboard must work. First: on a self made platen all connections must be tested for micro breaks and bridges. Check the polarity of the diodes! The 'nose' of the PIC must be placed in direction to the keyboard connector! On the keyboard connector also 5V must be measurable. On the PC keyboard, after switch on, the three lamps should flash on (PC keyboard self test). If the supply is ok. and there's no flashing, the PC keyboard is defect or a very old one. 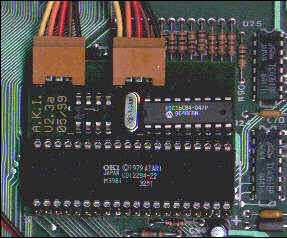 Check with a logic tester on RESET PIN4. There must be a hi, if not check R1 and C1 for bad connections. On PIN 15 (16) must be pulses (2 / 4 MHz), if not, check the crystal and PIC CPU (is the PIC correct programmed ?). On PIN 12 and 13 must be frequencies with 31KHz and 500Hz, if not test the connections to the POKEY. Now check for the same signals on (START, SELECT, OPTION, RESET), if there's no signal, check diodes and its polarity. The PC-key board layout is mostly identical with the printed symbols on the keys with the German / English (American) keyboard. The English layout is mostly common with the original ATARI layout, maybe some German PC users prefer her layout. Key numbers with several language functions: 3,7,8,9,10,11,12,13,22,27,28,40,41,42,45,46,53,54,55. 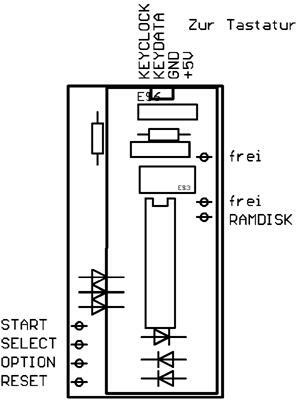 The keys START, SELECT, OPTION, RESET, also BREAK, SHIFT and CONTROL, are sampled in combination from the Atari. A standard PC keyboard cant sample combination codes*. Pressing more then one of these keys at the same time, under several circumstances can't be detected. The AKI user will not be able to press START, SELECT, OPTION and RESET at the same time (F5, F6, F7, F8). On a tested FUJITSU N860-8725-T853 and a NCR H0150-STD1-12, START, OPTION and RESET can't be pressed at the same time (is there anybody working with cassette drive and an AKI ?). Combinations from not more then 2 keys are working correctly. For other crazy keystrokes use the ATARI keyboard. I'm not sure that the 100% compatible TRANSKEY can handle these situations :-). Through the several language keyboard layouts it can be that some chars are not reachable. Mainly this is important for users of the German layout and an English keyboard hardware. On the English hardware the key 45 is not present, therefore a '|' cant be reached under German softwarelayout. Other problems can occur on other hardware/software combinations. * If it comes to a ghosting effect (the keyboard controller detects keys that are not stroked) through pressing more than two keys at the same time, the keys they are first scanned (in matrix order!) are guilty. This can be read in the technical documents for the keyboards. Keyboard macros are sent by the AKI. In the actual version the sending speed is not configurable, it can be that slow ATARI programs ignore some keystrokes sent by macros. The macro sending speed is tested in the standard BASIC there its ok. Perhaps in a new software version, there is the option to change macro sending speed. Another interesting effect is occurring when two keys are pressed very quick. The ATARI-OS is not able to detect 2 several keys in 100ms. Now with an new keyboard you can press the keys quicker, therefore it can be that some strokes are ignored. (for instance LDA > LA or STA > SA). Now AKI software caches 2 keystrokes, so this effect will be reduced. The AKI output has an so called 'open collector' therefore not all variants are uncritical to connect. Variant "A" gives no problem, the AKI switching output can be directly connected to the input of the extension (take care that the resistor dimension is >1KOhm). Don't connect to variant B or C, destroying the PIC can be result. If you have variant B or C in your ATARI, rewire it to variant A, the switching ability stays the same. Now you can contact your AKI output additionally. 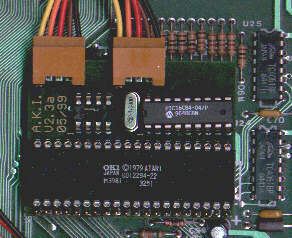 The AKI is a one chip processor system with an PIC processor with 64 byte internal EEPROM. The hardware is mostly the standard application for the PIC processor. The PIC is receiving the serial AT keyboard codes, interpreting it and simulate an keystroke in the ATARI keyboard matrix. The SHIFT and CONTROL keys are 1:1 software connected. The supply current is typical 20mA and the PC keyboard needs 70mA-160mA, and its no problem for the ATARI power supply. Liste mit allen bisher durchgef�hrten �nderungen (Bugreport) ! This is a hobby project of mine, that is free available for all ATARI freaks. This document and all linked files are �F r e e w a r e� and can be copied free or for a self cost price. The copying of CAD and assembler source files is n o t a l l o w e d . Reproducing the hardware is free for single boards for private/friends. The reproducing for commercial is n o t a l l o w e d .
Erhard 'Floppy-Doc' P�tz for the beta test, the info's about TRANSKEY, and the inspiration to make this side!. I have two of these AKI keyboard mods. This is a really cool upgrade due to the pic chips with built in serial mods making a PC keyboard even easier to do. Once again this is one of those mods you really want. the IBM keyboard is much better. I use pc keyboards for most things I find myself making errors when I jump on a real Atari keyboard. There are plans on how to build your own AKI keyboard mod. All you really need to do is pick the right pic chip and program it. PIC chips are really all in one computer in a single chip. The PC-keyboard layout is mostly identical with the printed symbols on the keys with the German / English (American) keyboard. The English layout is mostly common with the original ATARI layout, maybe some German PC users prefer her layout.